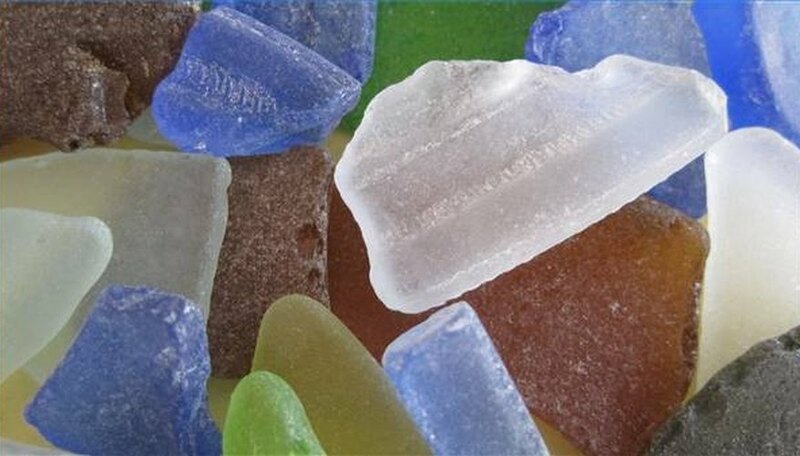 Comb beaches and shorelines for sea glass. They're found at the water's edge, hidden in grains of sand or concealed within a shell. Collect assorted colors, including rare blues and reds. Fill a vase or line a shelf with the treasured finds. Turn the frosted glass into pieces of jewelry or works of art to put on display. Decorated sea glass brings back memories of the salty sea and the pebbly river's edge. Take a trip to the beach and search for pieces of sea glass. Collect the sea glass in a bucket or bag, being careful not to break it. Wash the pieces of sea glass with warm, sudsy water. Gently clean off any beach residue (seaweed, barnacles or caked sand) with an old toothbrush. If needed, let the sea glass soak. Once the piece is clean, dry it with a soft cloth. Create a sea glass pendant. Choose a colored piece of sea glass with worn edges. Draw a "cage" design on paper. The shape will need to encompass the sea glass. Cut wire 2 inches longer than needed. Wrap wire around the sea glass per design. Leave about 1 inch at the top. Grasp the leftover top wire with round nose pliers. Roll the wire downward to form a loop. Secure end wires. Place pendant on a chain. Etch inspirational words. Purchase adhesive stencils with words such as "Believe," "Imagine" or "Dream." Clean sea glass as directed above. Define a suitable working area. Don rubber gloves and eye protection. Smoothly lay the stencil onto the sea glass. Dip brush in etching cream. Apply a thin layer onto the exposed surface of glass. Wait 5 minutes. Rinse off etch cream using a brush in work sink or with outside hose. Remove stencil and air dry. Paint an image or design. Clean sea glass as directed above. Cover glass edges with tape. Free stencil patterns are at http://stainedglasspatterns.com or http://find-stainedglasspatterns.com. Make a stencil from a coloring book page. Pencil design directly onto surface. Using Folk Art Enamel paints, paint the image. If desired, affix embellishments such as flat-sided crystals or seed beads. Remove tape when completely dry. Coat the sea glass with a clear varnish to seal the color. Protect working surface when using etching cream. Tape any rough edges of sea glass before painting or etching. Wipe off paint drips with cotton ball or cotton swab and mineral spirits. Etching cream is not intended for young children. Wear gloves and protective eye gear when working with etching cream. Use caution when working with glass.